Choosing a Free-to-Guest (FTG) Hotel Television System used to be a relatively simple process. Regardless of your clientele or the size of your property, the choices for a hotel owner or general manager to furnish your hotels with TV programming and TVs was cut and dried. 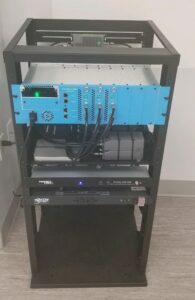 Choose a provider from cable, off air antenna or satellite programming, buy the size TV you wanted, install a headend system to distribute the signal and you were done. Pretty much everyone provided the same services. In the age of HD signals, Internet Protocol, Pro:idiom encryption, and flat screen TVs, your options for FTG television for your hotel have grown. In years past all people expected you to carry was the locals, HBO and ESPN. If you had a TV and a fairly clear picture and those channels they were satisfied. No longer. Now they want your hotel to provide the TV experience they have at home. That means a High Definition flat screen TV, 100+ channels in HD, and connectivity for all their electronic devices. Guests now expect to be able to access Apps on their phone or tablet. They expect to be able to listen to the radio or music on their iPad or smartphone through your hotel television system. They expect to be able to plug in their laptop to recharge and view it on the TV screen. What they expect is an entertainment system with the functions they enjoy at home. Some of the options available to you in TVs and the expectations of your hotel guests will effect the furnishings in your guest rooms. 1 – CRT TVs had to mounted to a desktop type surface. Flat Screen TVs can be mounted in multiple ways. 2 – New connectivity expectations for guests & the power requirements for these electronic devices can mean you will need to plan for where a connectivity module and additional power outlets will be placed in furniture. Guests now regularly bring and expect to be able to connect and recharge devices including iPads & iPhones, smartphones, digital cameras & recorders, gaming devices and laptop computers. Hotel television systems need to be integrated with these connectivity modules and this means that where and how they are installed in the guest room furniture is vital. Manufacturers including TeleAdapt and LG provide connectivity modules and “jack packs” to connect all the devices into your hotel television system and can be integrated in many types of hotel furnishings. How do Hotel Owners & Managers Cut through the Clutter? 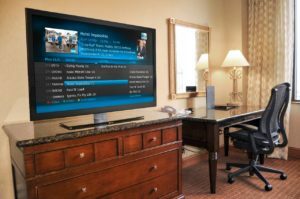 When you start your search for a new television system for your hotel, with all the interrelated systems it is critical to find and work with a single source for all your hotel needs. A supplier that is experienced in how your guests expectations can be integrated into a single hotel television system seamlessly. From finding you the right programming package to fit your guests expectations, to choosing the best option for a distribution system, to the TVs, mounts and furniture to best deliver that content to the guest, your first choice is your supplier. So, regardless of whether you operate a large hotel as part of a well-known chain or operate a small property or an independent hotel, making the right choices of furniture and equipment and getting the right hotel furniture suppliers on board will ensure your customers keep booking up with you again and again. When it’s time to investigate and invest in a new Hotel Television System, call It’s All About Satellites at 800-951-1979. Since 1996 we have provided hotels and the hospitality industry with the answers to your questions and the hotel television systems that fit your needs best. I love seeing connectivity panels in hotel rooms. Coolest thing I saw at HITEC this year was a wireless connectivity panel that looks like an alarm clock and allowed me to watch HD videos from my iPad on the TV. Probably was easy for the hotel to install to.